A drama team is a group at church that acts out sketches during the service as a form of worship. Churches that boast drama teams are usually of the large, warehouse, non-denominational variety. The drama team performs its sketches during youth group to inspire chastity, witnessing, or the upcoming youth retreat. They also perform at church services during Christmas and Easter and the weeks preceding them. The performances take place during the service after the bulletin announcements but before the third hymn. The Christmas or Easter sketch is a straightforward enactment of the modern western interpretation of Jesus getting born or killed. These are often called "pageants" and can include non-members of the drama team. (The type of person who will volunteer for pageants is often an, ahem, headstrong mother of several, or a retiree with a lot of time on his hands). These types of performances are very similar from one to the next. If they take place in a church that has the word Grace or Community in its name, the "actor" playing Jesus is invariably Caucasian. The drama team operates under the assumption that its sketches engage people and that people can relate to the situations that are portrayed. A typical church drama sketch contains a few props (more than two but no greater than six) and someone knocking on an invisible door which is then answered by someone turning its invisible knob. The sketch will also have a hapless character who does not know about Christ's love (yet!) and copes by being either overtly rebellious or by floundering listlessly through life. Conversely, the sketch will also contains a triumphant character who is self-assured and secure because of Jesus and knows "beyond a shadow of a doubt" where he'll go when he dies. Doesn't the hapless person want this too? Hapless does and 98% of the time prays to receive Christ at the end of the sketch while the sanctuary lights dim and "Amen!" is randomly shouted by a few brave people in the audience. In a true test of my burgeoning maturity, I was forced to play boyfriend to my then ex-girlfriend (she dumped me) in a drama performed on a missions trip to Mexico. It was poignant and distressing when we got to the part where I had to simulate my beating heart by patting my hand against my chest. This symbol of my simmering desire for her was almost too much for me to bear. I think we even had to hold hands during the sketch. Yeah, I know! In the end I think it made for one helluva a show. Are some of these sketches direct adaptations of Jack Chick pamphlets? I have one entitled "Fatal Decision" on my desk right now which I would love to see re-created. 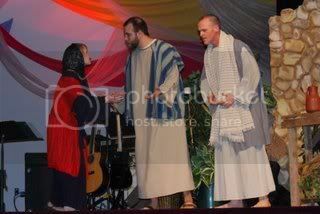 Did I ever tell you I played Mary in a Christmas pageant for paying customers? oh, man, guilty as charged. i was on one of these around the world. yes, ma'am. open air ministry you betcha. i actually have to admit our performance was pretty awesome. i'm standing behind it. Drama teams: for those who enjoy seeing their local high school chemistry teacher donning a cheesy wig in his portrayal of suburban Jesus. These productions are the evil offspring of puppet ministry, an equally effective outreach. anyone see the "lifehouse everything skit" ?? plug that into YouTube and see how they take it to a whole-nutha-leval. I went on youtube to look for The Champion church drama performances and there's a lot of them! Here is just one. 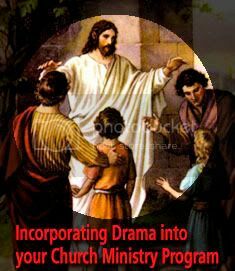 My church had a Christian drama troupe come several times while I was in youth group. There was a narrator with suspenders that could freeze time, allowing him to jump in and out of the narrative to give us a moral lesson. You'd see two kids (played by adults) being offered marijuana and arguing that, "...only doing it once couldn't hurt you." The narrator would snap his suspenders signaling the actors to freeze. Then he'd step out of the forth wall (theatre term) and say, "Now, do you guys think that Allison and Jeremy know agape love? Are they making smart choices with Godly hearts?" OMFG! 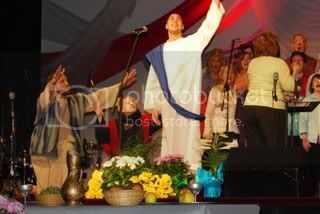 My boyfriend was in a Christian Youth Conference in Michigan where they performed Christ's Crucifixion. Yes, Jonathan was Christ and I have a picture of him, bloody and nailed to a cross in an auditorium filled with children. Nothing creepy there. Can we post picture here? I was once painted in black face for a sketch about racial understanding... still not sure why they didn't just ask that one black guy in the congregation to do it. also, 99.9% of them end with someone in the "jesus on the cross pose," arms out, palms forward, head drooping. that really brings it home for me, it's like "oh wow, that one nice person in the thing represented jesus!" After doing "Christian" drama (touring theatre) for over 20 yrs. I am of the opinion that Christians do not want quality, reality or true life situation portrayed by other Christians in theatre. What they are looking for is Bible verses, religious talk and key components as you have expressed above. This makes them feel comfortable. Yet for most part these same people like good drama in other "secular" venues (i.e. theatre, movies, videos) they are moved and "transformed" by these things but feel really strange when a Christian group strives for the same. Wow Charlie - what you said is what I've thought, but you qualify it with 20 yrs of experience. Thanks for your comment! I was forced to watch an Australian church drama team perform in my school when I was a teenager. They had toured all the way from Australia to Ireland, doing their thing in Protestant schools along the way. They wore all-white clothes and had little gold headbands like Monkey in the Japanese TV show. They did some scenes, told us about their Message and then asked us if we had any questions. Nobody did, but I had watched an interesting TV documentary the previous night, so I put up my hand and asked "Can you tell me why the percentage of Aboriginals in police custody in Australia is higher than the percentage of Black people in police custody in the USA?" I think they were quite annoyed by this question, although they did a good job of pretending not to be. It was one of the very few moments of heroism I ever had in my school career. Even the teachers were congratulating me afterwards. At my old church, they were always WAY melodramatic. There was one that featured a teen couple arguing about the fact that the girl was just impregnated with the boy's baby. A kneeling, hopeful-sounding but increasingly frightened girl upstage represented the baby. The teen eventually decides to have an abortion, causing the baby to scream bloody murder (in their view, literally). Almost all of our dramas took that dark, desperate tone. 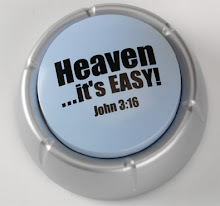 The others were invariably some Christian being harassed physically or tempted with sin (i.e. money, drugs, etc.) by non-Christians or demons, all of whom were writhing their hands dementedly. The Christian would then either succumb, prompting a very sad-looking Jesus to beckon the now sin-laden Christian back to his warm embrace, or the Christian would hear Christ's voice and resist, prompting Jesus to physically fight off the bad guys. All during some 'epic' Christian song (same type: female vocals, desperate tone throughout verse, heavy uplifting change as good fights back). As a fan and an actor of the stage, I was always a bit put-off by the horrible pantomiming and the even worse dialogue. When I was in high school, most of the churches in my area in the Southeast had this fling with the popularity of Christian Miming. Only select cool kids with the right kind of family were invited to participate too--Bloody awful. Bloody awful!! Late to the party, I know, but I had to chime in on this one. My high school church group featured a very strange Christmas performance. A girl stood in front of everyone with her shirt stuffed with clothing to simulate pregnancy, soulfully lip-synching Breath of Heaven. The second time she did this, some of the clothes were drooping out of her shirt, but she gamely soldiered on. I admired her tenacity, but had a really hard time stifling my laughter.